HOUSTON (Reuters) - Venezuela is considering producing fuels from foreign crude oil for the first time, according to planning documents seen by Reuters, as the country struggles to meet its obligations despite having the world's largest crude reserves. U.S.-based ConocoPhillips last month seized some of PDVSA's assets in the Caribbean seeking payment for a $2 billion arbitration award, reducing PDVSA's ability to deliver fuel and crude exports to Asian customers and regional allies. "The larger processing of crude would increase our fuel availability. It would also decrease the requirements (to import) of vacuum gasoil and diesel," said one of the documents prepared in May. The Urals cargoes had been discharged in Curacao for transfer to Cuba, but since Conoco began seizing PDVSA's Caribbean assets, tankers arriving from Russia have been diverted to Venezuela's Paraguana Refining Center (CRP), which includes its Amuay and Cardon refineries. To meet its domestic demands and PDVSA's fuel supply contracts, Venezuela would have to produce some 850,000 bpd of fuels, the documents show. From January through March, PDVSA's refineries supplied 78 percent of the 365,000 bpd of the fuels demanded by Venezuela's domestic market, which forced the company to import finished products including gasoline and diesel. Under the plan excluding foreign oil imports, PDVSA's domestic refineries this month would work at about 36 percent of their total capacity, or 473,000 bpd of Venezuelan crude, according to the documents, reflecting an acute lack of spare parts and delayed maintenance projects. On Wednesday, PDVSA's 310,000-bpd Cardon refinery restarted a vacuum distillation unit that was waiting for spare parts to be repaired. 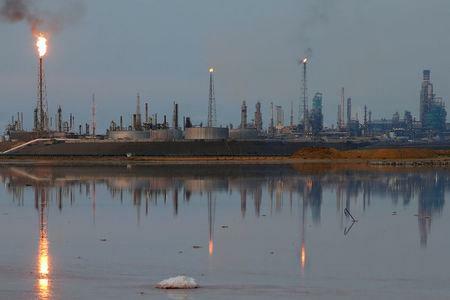 Last week, the 645,000-Amuay refinery restarted one of its crude distillation units. Those repairs are just some of the many still pending, according to the documents. At Venezuela's smallest refineries, Puerto la Cruz and El Palito, the lack of medium and light crudes has kept several distillation units out of service for months. The insufficient fuel production is affecting China's CNPC [CNPC.UL] and its subsidiaries the most as PDVSA would have to ship 258,000 bpd of fuel oil and jet fuel to these companies for repaying Chinese loans extended to the Venezuelan government in the last decade, but it typically delivers less than 100,000 bpd. Russia's Rosneft this month is entitled to 80,000 bpd of fuel oil, jet fuel and natural gasoline under oil-for-loan contracts, while Cuba and members of Petrocaribe should receive at least 108,000 bpd, according to current contracts.